also known as Aloe vera is part of the Liliaceae plant family.Aloe is native to East and South Africa and is grown in most subtropical and tropical locations, including Latin America and the Caribbean. There are over 500 species of Aloe, including Aloe perryi from Socotra Island or Zanzibar and Aloe ferox from Africa. History: The virtues of Aloe vera have been recorded for thousands of years by many ancient civilizations, including Egypt, Persia, Greece, India and Africa. The name was derived from the Arabic alloeh meaning 'bitter' because of the bitter liquid found in the leaves. It is also known as 'lily of the desert', the 'plant of immortality', and the 'medicine plant'. The fresh gel was used by Cleopatra to keep her skin soft and young. Aloe was used by the Ancient Greeks, Arabs and Spaniards and is still used by hunters in Africa to reduce perspiration and body scent. Aloe was used extensively by American herbalists in the 18th and 19th centuries. 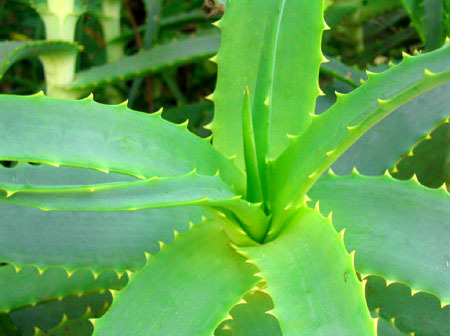 Aloe vera leaf contains more than 200 different constituents. The juice contains, on average, more than 99% water. and mucopolysaccharides* [MPS] (long-chain sugars). Mucopolysaccharides [MPS] are found in every single cell in the body. The human body stops manufacturing its own mucopolysaccharides around puberty and from then on must rely on outside sources. Cut the leaf and remove the gel from the inside. Clean affected area and then apply Aloe gel. The bitter yellow juice found between the gel and the outer skin of the leaf is dried and used as a laxative. It is reported that Aloe was used to embalm the body of Christ. Aloe tends to gripe and may cause constipation so should be combined with a carminative for best results. Aloe gel is considered safe when applied to the surface of the skin. Aloe gel is not useful for treatment of deep wounds. In rare cases, it may cause an allergic reaction. Glyburide (used to treat type 2 diabetes) in combination with Aloe vera may help control blood sugar and triglyceride (fat) levels in the blood.